Whether you are new to the probate business or consider yourself an experienced professional, there are times when you need to take a step back and make sure that your business model isn’t missing a potentially profitable option. Probates, with their deeply discounted prices and motivated sellers, can provide opportunities that you simply can’t find elsewhere. These properties exist in a wide variety of formats, from small residential properties, to dream homes to office buildings, and even strip centers and warehouses. There are many ways to find residential and commercial options in probate real estate. In thinking about probate real estate, it is important to understand why so many investors are now specializing in this industry. While there are many options in real estate if you choose to become an investor – everything from foreclosures to working with traditional buyers and sellers – there are few areas that offer the deeply discounted prices and flexible terms that can be found in probate work. The selling of probate real estate and other property is handled by a court appointed representative, called an Executor. This individual can be a family member, trusted friend or professional, such as an attorney or an accountant. As part of their responsibilities, they have to find buyers for the property that was left behind by a family’s loved one. The proceeds from these sales go to not only the family members, but to pay taxes, court costs, medical bills, funeral expenses, and other items such as past due credit card charges. This property needs to be dealt with in order to pay for these financial obligations. The process to buy or sell a probate home is much the same as many other types of properties. Brendan DeSimone said, “In a probate sale, the property is marketed just like any other property. The probate attorney or the estate representative will hire a local real estate agent, sign a listing agreement, and show the property, just as they would a traditional listing. Generally, the list price is based upon the listing agent’s suggestions as well as an independent appraisal ordered and issued by the court.” During a private sale, there would be no court oversight, but in a probate sale, there is a need by the Executor to quickly find buyers and get the property sold. This is one reason that the pricing can be so flexible in probates. Additionally, if the Executor lives out of state and tires of coming back to deal with estate issues, they may be willing to take a lower price on a property if the terms are favorable and allow them to wrap up the probate more quickly. WHY LOOK AT BOTH RESIDENTIAL & COMMERCIAL REAL ESTATE? What many investors don’t appreciate is that there are far more options in probate real estate than just single family homes. While there are many investors that specialize in residential real estate, there are also ways to profit in commercial land and buildings. There are cases where you can have the property professionally inspected. Everything depends on the laws of the state that you are working in, the terms of the probate and the desires of the court. As you are learning the probate business, take the time to find a mentor who can help you to understand the process of a probate sale. Part of that process is the submission of earnest money. This deposit is traditional in any real estate transaction and applies to both residential and commercial real estate. The amounts in commercial real estate would obviously be higher due to the increased purchase price. While some investors focus on residential real estate, there are options in commercial properties as well. 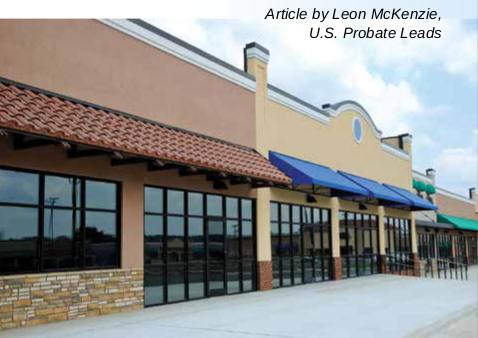 In fact, one of the most profitable areas in probate is working with commercial real estate. The researchers at Inc., said, “Buying commercial real estate is a complex undertaking that is difficult even for experts to time right to maximize their investment value, let alone entrepreneurs or business executives whose areas of expertise are in different industries. It’s also a venture rife with risk, as buyers, sellers, agents, and renters alike can suffer the consequences of a dip or spike in demand. At the same time, for a business, on the upside the potential rewards can be substantial.” If you are interested in a “substantial” reward, as the authors indicate, then commercial might be for you. What kind of commercial properties might you find in a probate? If an individual owned a business or was a real estate investor and held them personally, then the properties may end up as part of the estate that is being handled by the court. These properties may include everything from apartment buildings to undeveloped land, strip centers, office buildings, stores, restaurants, warehouses, industrial properties, doctor’s offices and medical facilities to malls and hotels. There is a wide variety of buildings that are considered commercial property with an equally wide range of pricing. Each of these properties has advantages to the investor depending on what your long term goal might be. Knowing that there are both residential and commercial options in probate real estate investing is one thing. Finding them is something completely different. USE A LEAD SERVICE. There are professional services that are available that can give you the information you need in order to pursue properties in probate. While you could go to the courthouse yourself and look through documents to try to identify which leads are worth pursuing, you can save yourself a lot of time and frustration by having a lead service deliver that information right to your email. These services are both economical and helpful in that they provide information you might not otherwise find on your own. CONTACT PROFESSIONALS IN THE FIELD. As your business develops, you may want to work with local estate attorneys or accountants. They would have firsthand knowledge about properties that may become available due to a change in family status. Building a relationship with them and offering them a finder’s fee can be a great way to add to your portfolio. Once you do find a property that you are interested in pursuing, the next step is to follow up. Generally, probate investors have found that a professional letter directed to the Executor is a good way to start the conversation. There are several critical components to your communications with an Executor. A short introduction of who you are and why you are contacting them is a good way to start. Adding information about what you do and how you can help them may spark some interest. Inserting a comment about how you found their information, such as, “Your property was listed as part of a search I was doing through public court documents,” will help them to understand that you are simply contacting them to see if they are interested in selling their home or commercial property. Make sure to add in all of your contact information, including your email, website address and cell phone number so that they can reply to your letter. Understand that an Executor may not contact you after one mailing. Plan to follow up every thirty to forty five days for a period of about six months. These repeated mailings to residential and commercial Executors will help establish you as a serious investor and will be respectful of the many steps that these administrators have to take to close an estate. When someone does reply to a mailing, call them back right away. Once they have made contact, they are clearly ready to have a conversation, so promptness is key. Finding the best options in residential and commercial probate real estate is a blend of knowing what you are looking for and reaching out into the community. While residential real estate may have a lower sale price, it may also not yield the same rents and income that a commercial property might. Take this into consideration when deciding about your next property. For more personalized advice, call the team at US Probate Leads. We offer a professional lead service that can get you the most up-to-date, viable leads for the counties that you work in and provide additional support. We offer a wide range of tools that includes communications software, ebooks, webinars, seminars and even an individualized mentoring program. When you are ready to take your business to the next level, call (877) 470-9751. We can give you more information on how we can help you build your probate real estate business.